We have established a trails/pathway development fund through the Community Foundation of Greater Flint. LAFF Pathway Fund at www.cfgf.org. to link to the Community Foundation of Greater Flint. We are closer to connecting our communities with a network of non-motorized pathways. These pathways will afford everyone the opportunity to get outside and be active -walking, jogging, bicycling or strolling the baby along quietly. Enjoying nature, wildlife and outdoor spaces are proven ways to reduce stress while improving health. Additionally, these pathways bring in visitors who boost the economic development and stability of our communities. Pathways provide non-motorized routes to work, school, the store or market or any one of our many beautiful lakes or parks. 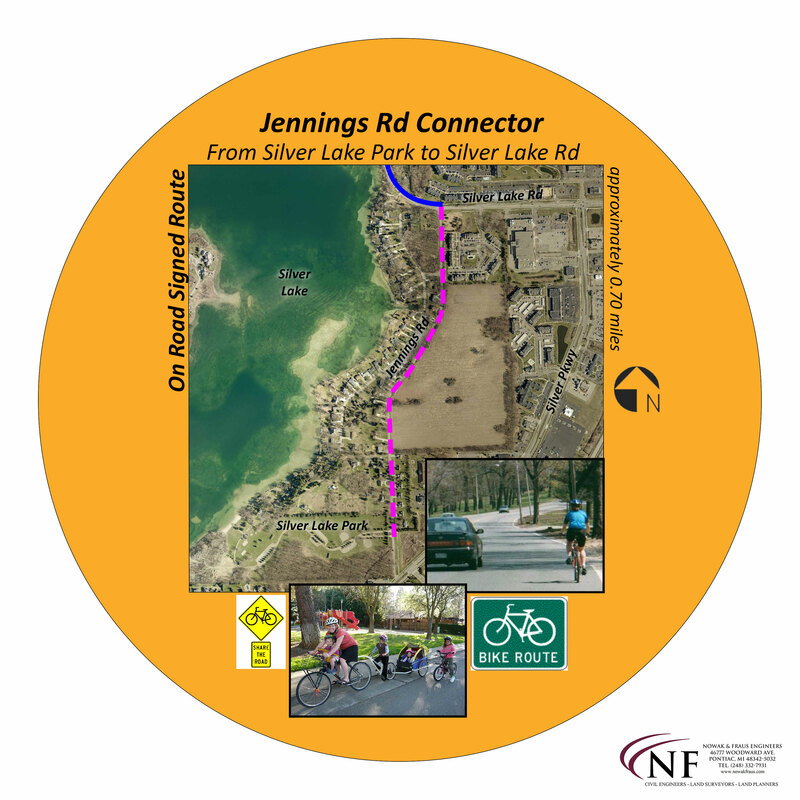 The preliminary design engineering is complete on the Fenton-to-Linden Pathway paralleling Silver Lake Road. Argentine Township raised just over $1 million through local, state and federal grants - placing the Argentine-to-Linden path just ahead of the construction timeline for the Fenton-to-Linden section. Through Southern Lakes Parks & Recreation (SLPR) & our local municipalities together we’ve raised the $108,000 needed to satisfy the local match dollars required for the Transportation Alternative Program (TAP) Grant application. Note the financial benefit from working together. These dollars are being used to acquire an additional $732,000 in grant dollars. 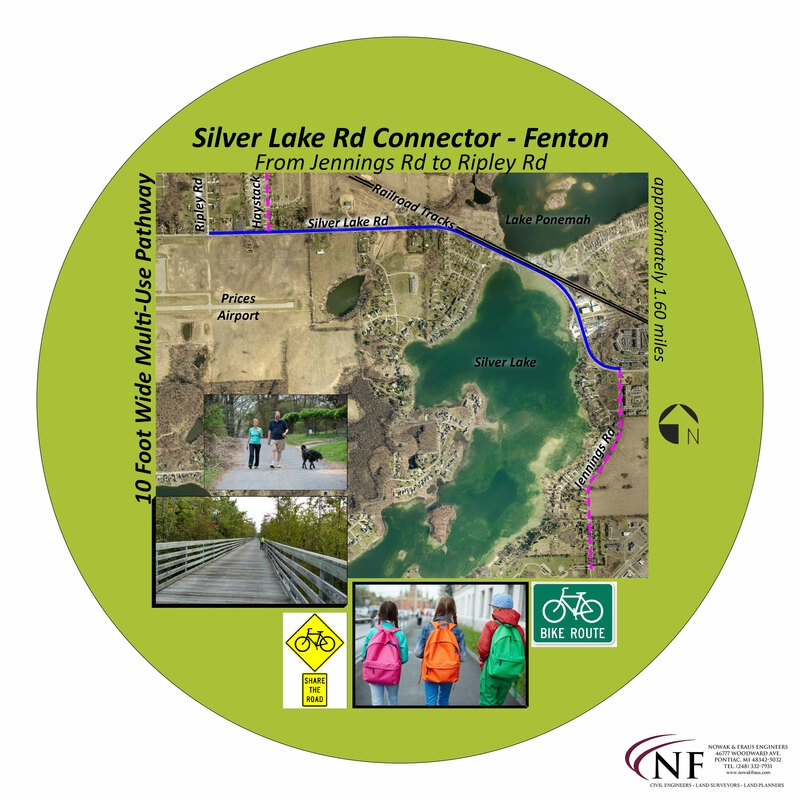 The Fenton-to-Linden pathway is projected to cost $2.4 million, of which, due to matching grant opportunities, will require an estimated $750,000 to be funded locally. This project can be realized by raising a combination of private and public dollars in 2018-19, completing the construction engineering in 2019 and pathway completion in 2020-21. The LAFF Pathway network is the largest regional project of our time, and you can be part of it. Please, make your tax-deductible donation right now to the Community Foundation of Greater Flint’s LAFF Pathway Fund. Go online to www.LAFFPathways.com and click on Donate to the LAFF Pathway link. Thank you for your generous gift which will have a lasting impact on enriching our communities forever. 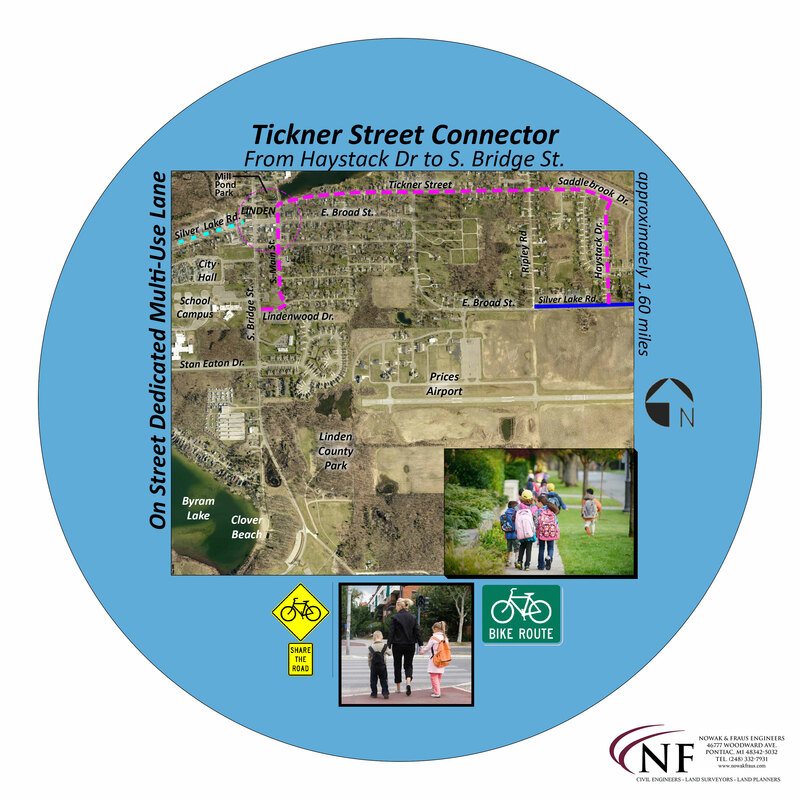 Non-motorized PROPOSED pathway between the City of Linden and City of Fenton is represented in this aerial map provided by Nowak & Fraus Engineers in cooperation with LAFF and the local communities. The pathway runs from near Jennings Road to the west side of Tri-Angle Park in Linden. The pathway is approximately 2 miles long with .6 miles in the City of Fenton, 1.3 miles in Fenton Township and .1 miles in the City of Linden. As always when you see your local representatives to these communities tell them you desire these pathways be built in our southern Genesee County Communities. THANKS. 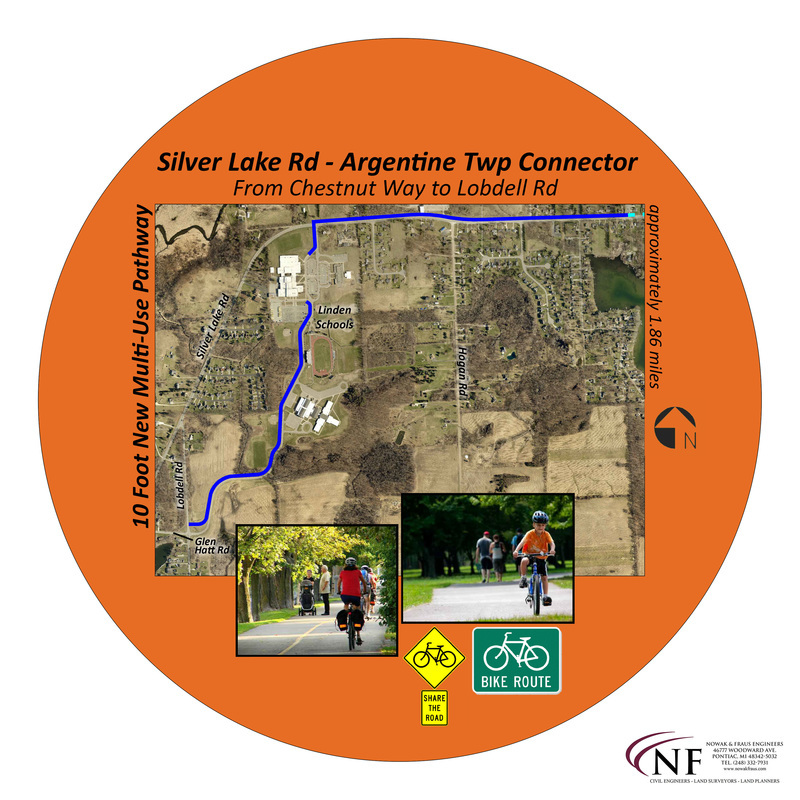 These images represent a concept route for CONNECTING COMMUNITIES of City of Linden, Argentine Township, Fenton Township and City of Fenton with a non-motorized pathway system. This routing was derived from public hearings held by the various communities and the Genesee County Planning Commission. The route has been supported by resolution of each community board or council in their public meetings. Final design work and additional public input is required to develop construction engineering plans. 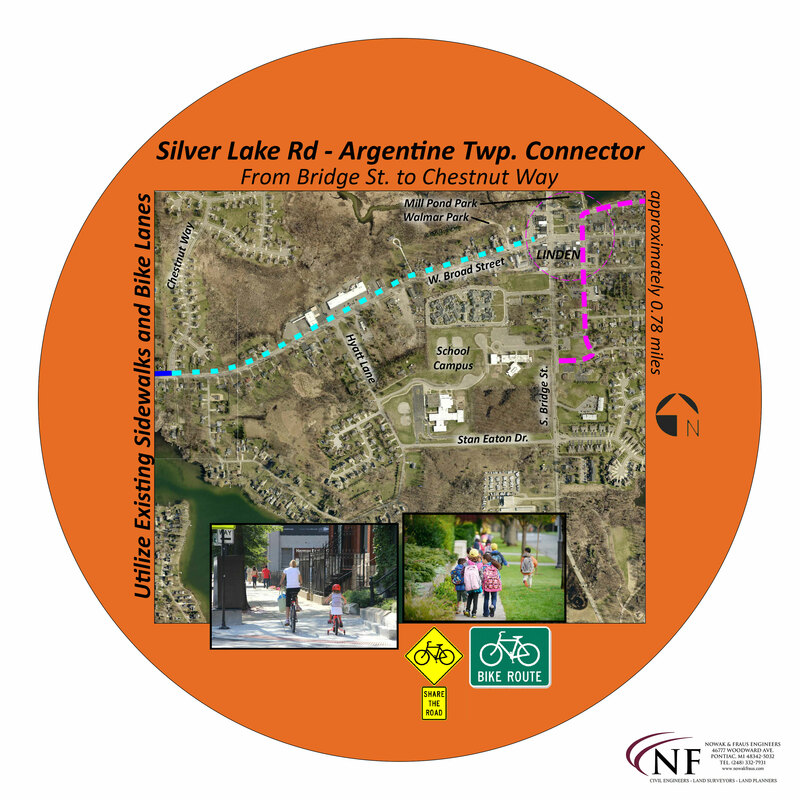 The LAFF Pathway’s vision is to connect the Linden, Argentine, Fenton, and Fenton Township (LAFF) communities with non-motorized pathways that create recreational opportunities and alternative forms of transportation, improve public safety, increase community and home values, and realize economic gains for area businesses. The LAFF Pathway will seek financial and volunteer resources to assist our local communities with the construction of non-motorized pathways. The total economic benefits from bicycling in Michigan are $668 million, according to the Michigan Department of Transportation (MDOT) 2014 study. This does not account for dollars generated by other users of trails such as runners and walkers, to mention a few.